Soleil @k, the first floor restaurant tucked inside the Marriot Gaslamp, is a refreshing haven amidst a busy urban landscape. You may have passed it before—the restaurant’s open walls and casual patio sit just steps from the entrance to Petco Park. But while the restaurant looks alluring from the outside, you must set foot inside to truly experience its delights. An entrance on K Street leads to the single room that houses both dining room and bar. High ceilings and large glass-paned walls give the space a casual, open feel, intensified in the warmer months when the glass walls are folded back to eliminate the divide between indoors and out. Fixtures like low-hanging pendant lamps, clear acrylic fans, and tiered votive candle holders lend a minimalist elegance, while a translucent divider blurs the distinction between bar and dining room, ensuring a hint of playfulness amid casual elegance. The centerpiece of both design and utility are two oversized farmhouse tables that run down the center of the room. They are set in communal fashion, where parties of various sizes are all seated at different spots along the same table. The vibe is that of a neighborhood spot, where friendliness extends beyond those you came with. Smaller, window-side tables and u-shaped booths offer a hint of privacy, but overall the emphasis is on community—this isn’t a quiet restaurant to hide in. The high energy level from both the bar and dining room carries throughout the space, and if you were in a laid back mood when you entered, you’ll certainly feel spirited by the time you leave. 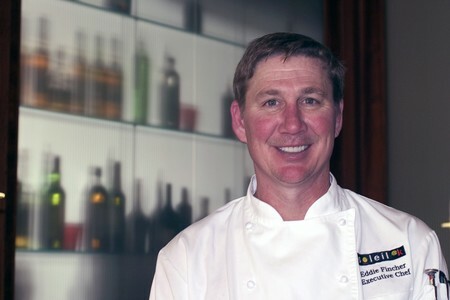 Executive Chef Edward Fincher’s menu features what he calls "New American Cuisine," modern renditions of classic flavors and dishes. Community is again emphasized on the menu, with a selection of small plates that are meant to be ordered for the table and shared. Eclectic and enticing, the array of offerings includes both the familiar and the new. The Artisan Flatbreads seem to be an elegant cross between delicate canapés and comforting pizzas. Each of about six offerings feature crisp, wood-fired dough topped with a medley of fresh ingredients and cut into triangular slices. The Rock Shrimp and Avocado is wonderfully inventive—the thin, crispy crust is coated in melted pepper jack cheese and topped with crumbled chorizo, slivers of roasted red pepper, pale rock shrimp, and slivers of avocado. Each ingredient is wildly diverse, not only in flavor but in texture and shape, yet somehow the pieces come together in a harmonious whole. The BBQ Rotisserie Chicken flatbread is American at its core. Combining two essential American favorites—pizza and barbeque—and managing to do so elegantly, is no small feat. Chef Fincher's version features light, crisp crust, creamy Monterey jack cheese, tender chicken, caramelized onions, and a piquant, delightfully tangy barbeque sauce that is elegantly drizzled atop the entire creation. The caramelized onions are practically liquid, their sweetness pairing perfectly with the sauce's sharp tang. 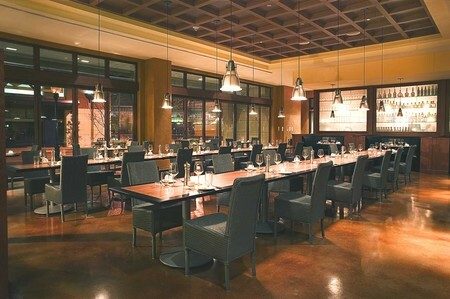 Perhaps mingling comfort and elegance is what Chef Fincher does best. Two small plates—the Lobster Ravioli and the Fried Brie—showcase opposite ends of the spectrum, one the epitome of comfort, the other quintessential elegance. We go for comfort first—and are delighted to find how over-the-top it is. Fried Brie is no less than exactly what it sounds like: a plump triangle of creamy cheese, breaded and plunged into the deep fryer. The result is exponentially comforting. The crisp golden shell breaks to reveal a molten, ivory-colored cream that gushes forth. It is magnetic—we instantly pick up pieces of fruit and bread to scoop up the liquid decadence. We eat quickly, not wanting the hot brie to harden, and I realize that with a larger party this could easily be gone in minutes. Perhaps that's why it's one of the most-ordered dishes on the menu. The Lobster Ravioli is not ravioli at all, but a playful deconstruction of the familiar dish. The presentation is stunning: a wide, shallow bowl holds a towering sculpture of plump medallions of lobster meat surrounded by a pale pool of chardonnay cream sauce. Swirls of golden oil dot the sauce, and an outer ring of deep brown wild mushrooms offer stark contrast to the cream-colored dish. A flat sheet of pasta—the one element that makes the dish worthy of the name "ravioli"—hides beneath the opaque sauce, becoming apparent only when the fork accidentally discovers it. The lobster meat, left unadorned amid the dish’s creamy flavors, brilliantly showcases its pureness, while the aromatic cream offers hints of truffle oil, and is almost silken in delicacy. The mushrooms are almost essential—their deep woodsy flavor anchoring the light, fleeting flavors of this dish. If Chef Fincher’s dishes are alluring, so are their liquid counterparts, thanks to General Manager Reggie Parks, who manages the restaurant's wine program. His enthusiasm is refreshing. "I try to find things that are approachable," Parks explains of the eclectic wine list, adding: "I'm trying to find the cool stuff, to make a fun list." There are over 30 wines offered by the glass, ranging from easily quaffable to complex and intriguing, as well as an enticing array of wine flights. Many seem to pair exceptionally well with Chef Fincher's diverse array of small plates. A Dr. Loosen Riesling has a crisp acidity and an off-dry sweetness that seems made for the eclectic flatbreads, while a Jewel Collection Viognier offers a peppery backbone that cuts through the richness of both brie and lobster. For the main courses, we move to a versatile Keller Estate Pinot Noir. Chef Fincher's main courses are straightforward and honest—any one of them would make for a comforting, satisfying meal. The Macadamia Nut Crusted Sea Bass is an explosion of harmonious flavors and contrasting textures—it’s the pairing of the two that keep the dish interesting. The locally caught sea bass is a pale, creamy fleshed fish, with a subtle sweetness and a fresh, vibrant flavor. Dredged in a rich mustard mixture and then coated with crushed macadamia nuts, it comes hidden beneath a spiky, coarse crust. An accompanying fruit salsa offers the vibrant flavors of mango and kiwi, offering a refreshing interlude between nutty, creamy bites. The most bewitching part of the dish is the lemon buerre blanc sauce, with a vibrant dichotomy of acidic lemon and creamy brown butter that lends a crisp, toasted flavor. The Herb Crusted Rack of Lamb wins me over. The lamb is sourced domestically, coated with a fresh rosemary pepper crust, and roasted to perfection. Cut into double chops just before serving, the tender pink meat glistens with moisture. The meat balances halfway on a bed of roasted garlic mashed potatoes and halfway in a pool of deep rosemary demi-glace, with a colorful array of glistening, roasted baby vegetables. The accompaniments are tempting, but is the lamb that shines. There is something so elemental about the preparation—simply rubbed with fresh herbs and roasted—that makes the lamb's natural flavor the most stunning taste on the table. 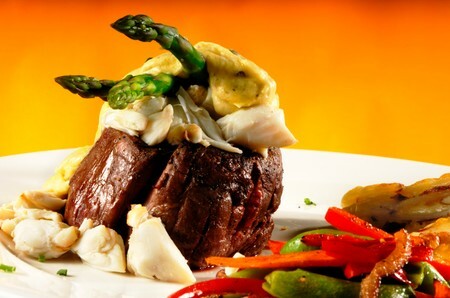 Like the lamb, the Applewood Bacon Wrapped Filet is a simple dish, executed to perfection. There are no surprises in presentation—a perfectly seared, hand-cut filet of grass fed beef wrapped with bacon looks picture-perfect. Like the lamb, it is also surrounded by a deep red demi-glace and fluffy, airy mashed potatoes. This is natural beef—an option some chefs shy away from for fear guests won't find it as fatty or as flavorful. But grass-fed beef has a flavor of its own, one that seems more authentic, more real than its corn-fed counterpart. Each bite of the grass-fed meat is deliciously tender, gliding like velvet across the tongue. The bacon’s sweet fattiness subtly enhances the lean flavors of the beef, and I enjoy the dichotomy, relishing in how the flavors work so well together. Generous portions make it difficult, but the desserts at Soleil @k are worth saving room for. The Florentine Cookie Basket is light and playful, featuring an in-house creation of candy-like brittle shaped into a bowl and dipped in chocolate. The resulting "basket" is filled with a scoop of vanilla gelato and topped with fresh berries. The dish actually improves as we eat it, the melting gelato softening the brittle beneath it. The Chocolate Baby Cake—a decadent dessert made by a pastry chef friend of Fincher's—is devilishly rich. A fist-sized, gooey chocolate cake is filled with mascarpone and chocolate chips, offering the consistency and flavor of a deliciously undercooked brownie mingled with cheesecake. This is gooey, indulgent heaven. But at Soleil @k, dessert isn't the only sweet conclusion to the meal. When the plates are cleared, each table is brought one last delight: a foot-tall tower of cotton candy. On the evening of our visit, the flavor du jour is lemon blueberry, an elegant and surprisingly addictive alternative to bubblegum pink. As the plump, airy pieces dissolve on our tongues, I already start to reminisce about the carnival of delights we have just experienced. Returning to this Gaslamp gem will be easy. Main Dining Room | Breakfast 6:30 a.m. - 10 a.m.